We are a collaborative team of researchers studying Drosophila-Wolbachia interactions the evolution of reproductive isolation in many systems. Our current projects combine approaches from genomics, genetics, cell biology, and population biology to better understand Wolbachia effects on host physiology and fitness that underlie Wolbachia spread. This knowledge is crucial to improve the efficacy of Wolbachia from Drosophila as a biocontrol of vector-borne disease (particularly dengue and now Zika). Our field work takes us from local orchards to sites overseas where we sample Wolbachia-infected flies from Africa, Asia, Australia and South America. We are fortunate to conduct our lab research at the University of Montana in beautiful Missoula, Montana. By comparing mitochondrial, nuclear, and Wolbachia genomic variation we are determining the age of Wolbachia infections and the modes by which hosts acquire them (e.g., from common ancestors, through introgression, or horizontally). We are also evaluating Wolbachia frequency variation through time and space in populations of a number of Drosophila species. Several projects are focused on identifying Wolbachia effects on host physiology that enable Wolbachia to spread from low frequencies in host populations. In total, we are currently working on about 20 Wolbachia-infected Drosophila systems. Several projects are assessing the genetic basis of Wolbachia effects on host physiology and fitness that underlie Wolbachia spread. For example, we have demonstrated that factors in host genomes modify the strength of Wolbachia-induced cytoplasmic incompatibility (CI). (CI reduces the egg hatch of uninfected females mated with Wolbachia-infected males.) In multiple systems, we have also found support for the theoretical prediction that CI loci are under weak purifying selection, with evidence that non-CI causing strains often have remnants of CI loci in their genomes. Very recent results have also revealed that insertion sequence elements within WO prophage regions mediate horizontal transfer of CI-causing operons (independent of WO phage) between divergent Wolbachia . 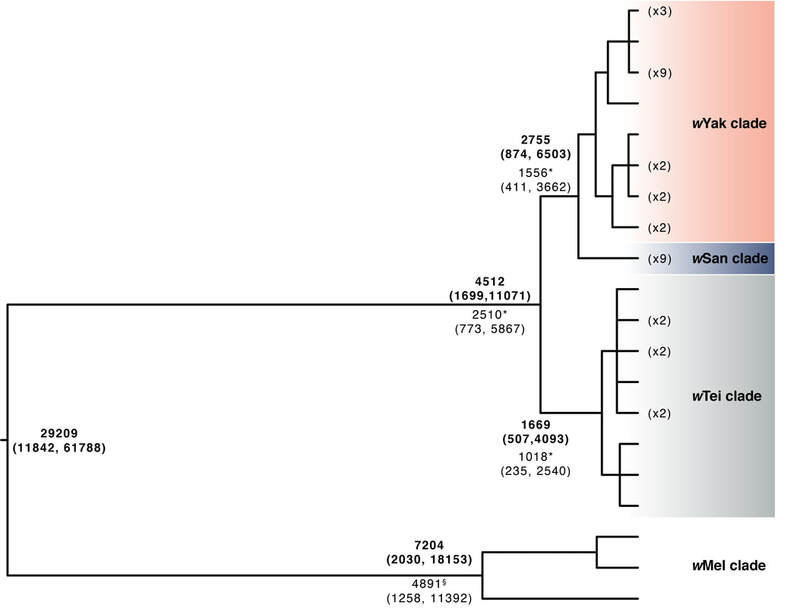 The figure below shows that wYak-clade Wolbachia prophage regions contain two sets of CI loci, with transposon-mediated horizontal movement of divergent cin loci into wYak-clade Wolbachia genomes—these loci are absent from sister wMel, but present in wPip Wolbachia genomes. Theory indicates that equilibrium Wolbachia frequencies are determined by selective effects of Wolbachia on hosts and the fidelity of maternal Wolbachia transmission. We are focused on bridging gaps between Wolbachia cell and population biology to explain temporal and spatial fluctuations in Wolbachia frequencies within host populations. This includes assessing variation in the fidelity of maternal transmission in the field, in combination with analysis of Wolbachia titer and localization in developing female oocytes. We are particularly interested in determining contributions of host and Wolbachia genomes to these phenotypes. Image by graduate student Jessie Bailey. Our group is also interested in understanding local adaptation within, and the evolution of reproductive isolation between, host species. In the past this research has involved assessing the cell basis of temperature adaptation in natural and experimentally evolved Drosophila populations. More recently, we've described a new D. yakuba-D. teissieri hybrid zone, in collaboration with Daniel Matute's group. Because Wolbachia are maternally transmitted endosymbionts, hybridization and introgression can lead to between species Wolbachia spread. In this way (and others), our work on local adaptation and reproductive isolation overlaps nicely with our work focused on within and between host Wolbachia spread. We are currently funded by the National Institutes of Health (NIH) to determine the effects of Wolbachia on host physiology and fitness that enable Wolbachia spread. We are grateful for this funding and for past funding from the NIH, the National Science Foundation, and several other agencies.